Live chat software, very simply, is a necessary tool for businesses looking to increase response times to customers, the speed at which customers can acquire a solution to whatever issue they may have, and the ability to push customers through the pipeline faster when opportunities present themselves. Instead of speaking to a bot, customers can speak to a real agent in real-time, which opens up the possibility of receiving a more personalized experience. Businesses who offer personalized experiences tend to see positive feedback in regards to the customer experience. Regardless of how long your company has been in business for, live chat software is worth the investment. 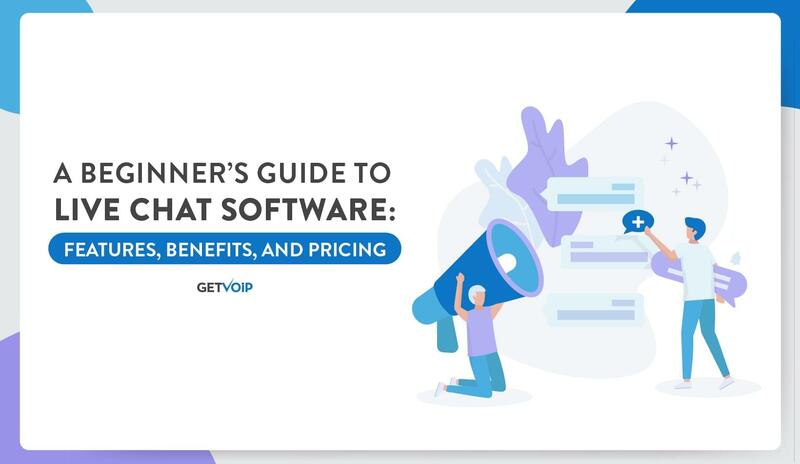 This beginner’s guide to live chat software will break down the features, benefits, and pricing plans of some of the top live chat software providers. So let’s get started with what exactly live chat software is. As we said, it’s a tool that helps businesses and customers interact with each other more efficiently with quicker response times, but what does that actually mean? There’s a real agent behind that picture waiting to help you if you choose to respond or ask a question. They’ll also be triggered to send a message based on certain actions. For instance, if you click on a product page, they might send you a message asking if you’d like to go straight to checkout. If you’re looking at a knowledge base, you might be asked, “Can I help you find an article or tutorial?” The possibilities are endless. However, the point of the software is to establish a connection with a website visitor or mobile app user. Live chat software also goes beyond a business’ website. If that business has a product page on Facebook, Twitter, or Instagram, live chat software can integrate with those channels to offer an even more personalized experience. Live chat is often looked at as a support-specific solution, but live chat software is being used for so much more in 2019. Now that we understand what live chat software is and its purpose, we can break down the benefits of using live chat software by team. 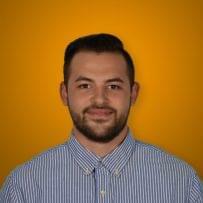 Sales teams can benefit from live chat software in a number of ways. First, agents can use live chat as a quick way to schedule appointments with leads. Live chat is a less awkward way to break the ice with a potential buyer because it doesn’t involve a face-to-face interaction or a phone call that might not even go through if the caller is forced to wait on hold. Instead, the lead can send a quick message to an agent asking to meet at a certain time. The agent can respond instantly and have the information logged into their schedule automatically with virtual assistants. Third, agents can push leads through the pipeline much faster if they know the lead is looking for quick results. They can initiate a conversation asking if the lead would like to go right to their cart. When websites offer users the ability to save their card info for future purchases, like Amazon, all it would take to complete a purchase is for the lead to say yes and then confirm the purchase at checkout. Finally, agents who wish to speak to their leads, and vice versa, can do so whenever they please — and, of course, whenever appropriate. What we mean is that live chat is available 24/7. Instead of waiting on hold to confirm an appointment, the lead can ask a question whenever he/she wants, and that agent, even if they’re on the phone with someone else, can respond immediately. Faster responses lead to more positive customer experiences. 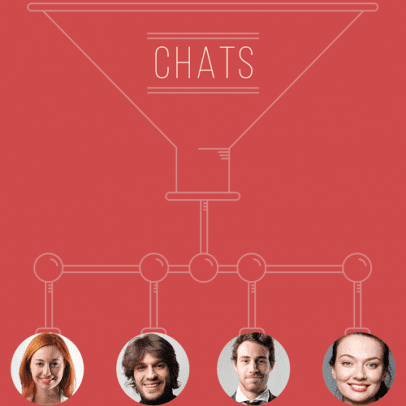 Marketing teams use live chat software to increase the number of leads they speak to in a day. Marketing is a numbers game — the more leads you can speak to, the higher the odds of finding qualified ones who are worthy of being reached out to by the sales team. Live chat is quick and easy for both the agent and the lead. Both sides can do other things while they speak to each other, which makes reaching out to a lead significantly less intrusive. Because live chat software has multi- and omni-channel capabilities (we’ll talk about that more a little later), it allows agents to cross channels and open up the potential range of leads to work with. This also allows for more personalized marketing strategies. If a marketer wants to close the gap between their website and social media, they can do so by choosing a live chat software solution that integrates with social media. And this is imperative for marketing in 2019. Each year, social media is playing more and more of a role in marketing and selling. Working on a personalized platform naturally puts the lead at ease as opposed to calling from a random number, which makes the lead more skeptical and less open to doing business. Meeting the customer where they’re already at is key. Live chat software also allows marketers to track customer data, which can help locate where customers are, how long they chat with an agent for, who they chat with, what they’re looking for, on what channel they’re communicating from, and much more. This data helps build essential context for sales agents who want to go into a conversation already knowing what the customer wants to push them through the pipeline faster. Live chat for support teams is imperative in 2019. Customer expectations are extremely high in conjunction with rapid technological advancements in AI, automations, and omnichannel. Self-service is also a major trend for good reason. If customers don’t feel like your agents can’t meet their standards — which seems to happen often if you ask anyone who works customer service in retail — they should at least be provided with the tools they need to fix the problem themselves. A customer can ask for help from anywhere. They no longer have to wait on hold and they definitely don’t have to find a store closest to them, which might not even exist. Instead, when the realize there’s a problem with their purchase, they can go to your website or app and ask an agent for help and get that help instantly — even during off hours. AI-powered chatbots are the new norm with live chat software. Agents can’t be around 24/7, but that doesn’t mean customers can’t get support during off hours. 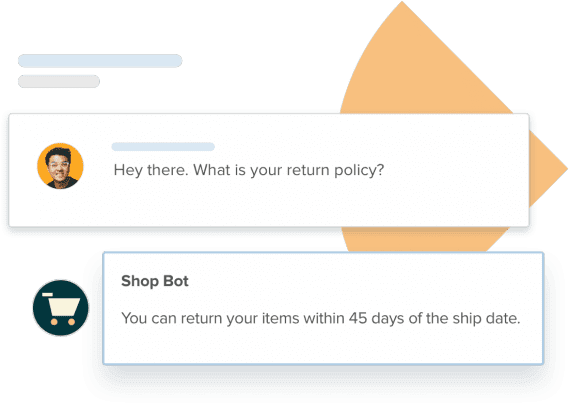 Instead of leaving customers to their own devices (pun intended), they can confidently work with a chatbot to ensure they get the same personalized experience. 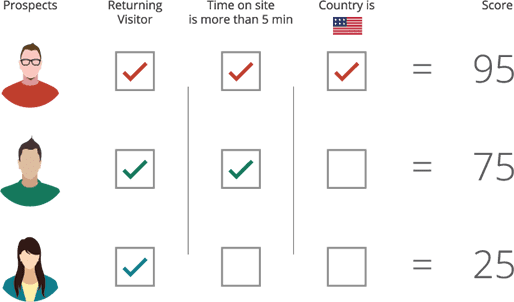 If your business has overseas clients, live chat software will become your best friend. Some software even allows customers and agents to pick up where they left off if they’ve had a previous interaction. This makes it much easier for both sides to figure out what’s wrong, what the previous history is, and how to move forward. Instead of putting the customer on hold, the agent can simply scroll up through their conversation to see what the potential problem might be as the customer continues to message the agent. 51% of consumers say a business needs to be available 24/7. – Inc. 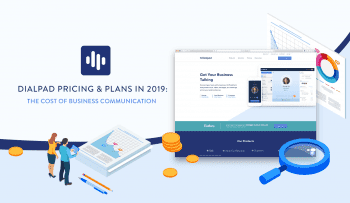 There are tons of live chat software options for businesses in 2019. However, it’s imperative to choose a provider that offers a solution to businesses that align with the latest business trends while ensuring the user experience is optimized and customizable to a business’ liking. Here, we’re going to break down some essential features to look for when purchasing or even going with a free live chat software. Lead and agent routing is essential to optimizing the customer experience. Whether you’re a sales, marketing, or support agent, it’s important to be paired with customers who want information on products you’re well-versed with or want help resolving an issue you’ve fixed a thousand times already. The last thing you want to do is pair the customer with an unhelpful agent who can’t fix their problem quickly. If your business wants more personalized customer experiences and buyer’s journeys, it’s imperative leads and customers are matched with agents that they’ve worked with before or are experts in what they’re looking for. Look for live chat software that offers lead and agent routing. For example, LiveChat offers lead routing which gives companies the power to auto-assign leads to agents as they come in or use a round-robin format based on the account owner, location, and other variables. You’ll be doing your agents and customers a disservice by not looking for live chat software that comes with a mobile app. Leads and customers use mobile apps regularly because their phones are always nearby. And problems arise with products they purchase when they’re away from their computer. The last thing you should do is limit the ways customers can reach you. Look for live chat software that comes with mobility features to ensure you’re giving customers new channels to work with and communicate with your agents on. Younger generations look at mobility features as standard operating procedure. It’s nothing new to them. If you’re not providing them with a mobile experience, they’ll go to someone else that can. When combined with social media integrations, you create an omnichannel experience that can personalize the overall experience significantly. This is what your customers are looking for, and businesses that offer this kind of experience tend to see better results. Chatbots have been around for a while now, but they’re becoming significantly more powerful, useful, and popular thanks to AI. These bots use AI for sentiment analysis and natural language processing to determine what a customer or lead wants without having to ask the customer for specific, robotic commands. Instead of having a support agent on call 24/7, businesses can take advantage of chatbots to offer customers personalized experiences even when they’re away. This helps to improve the employee and customer experience in a couple ways. First, agents don’t have to be in the office as often. Second, chatbots can be used to determine whether or not a customer inquiry even needs an agent. Tons of customers reach out to customer support because they think that that’s the only way to resolve an issue. 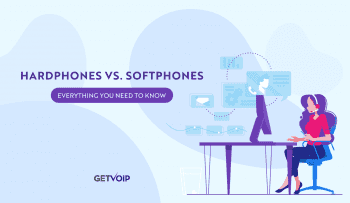 However, if they know there are self-service options out there, they’ll do whatever resolves their issue fastest, which also ensures agents are only working with people who have more complicated problems. CRM software aims to manage all the customer data a business acquires. 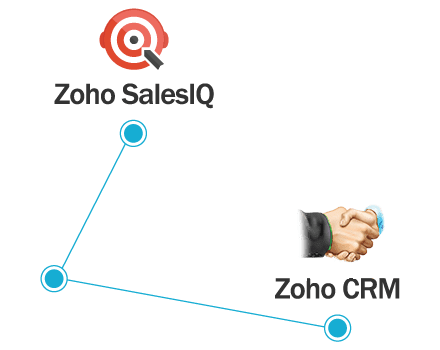 There’s CRM software solutions for sales, marketing, and support teams who want to take all the data they acquire and turn it into valuable reports that can ultimately determine what the best strategy going forward is. The live chat software solution you choose should be able to integrate with CRM software because there’s tons of information that comes from a conversation with a live chat agent that can be used to optimize your business’ sales, marketing, and support strategies. Some providers can use chatbots to ask customers to fill out forms before or after speaking with an agent. Those forms can ask for contact information or simply ask the customer to rate the overall experience. Whatever the case may be, your CRM software would interpret that data for you and make it valuable. This is a simple feature that makes it easier for both parties to understand who they’re dealing with. Customers who can access an agent’s profile before dedicating their time to a potentially-lengthy conversation can avoid wasting their time by seeing if they’re the right fit for their problem. Alternatively, agents can look at a customer’s profile and determine if they’re the right person to help them. If they are, great; if not, they can redirect that customer to an agent that can help them. Marketers can also look at those profiles to determine what products are best for a lead and how they should go about targeting them with ads. It’s a simple feature aesthetically, which isn’t exactly meaningless — personal branding does make a difference — however, personalization on all aspects of a website make it more encouraging for customers on a psychological level to try something new. Customizable and automated triggers are also imperative for agents who wish to send a message at exactly the right time without needing to be hovering over their computer every second of their lives. 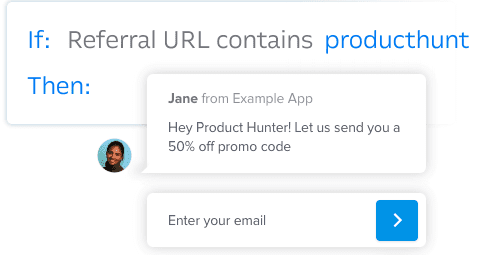 Triggers such as a lead clicking on a product page can automatically send a message to the lead asking if they’d like to go to checkout or speak to an agent. What else is important is that those triggers should be customizable to fit the specific needs of the agent. If a marketing agent wants to know more about what a person is looking at or how they respond to certain ads, there should be a specific trigger that caters to the ad they click on. The sooner they get a conversation going, the easier it will be to qualify a lead and send them to sales. 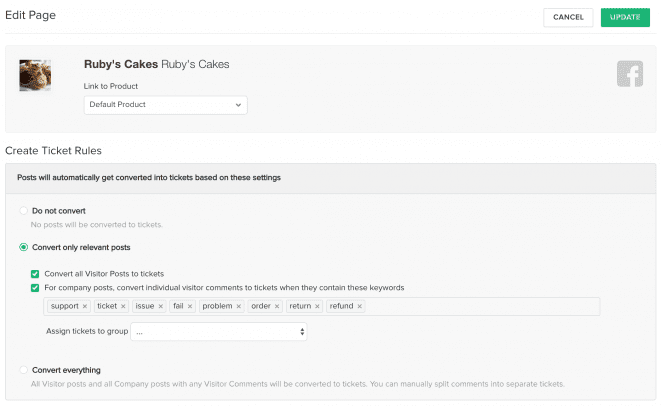 This is a major feature that cannot be sacrificed when purchasing live chat software. Social media is one of the biggest sources of leads for businesses and it’s becoming more and more associated with businesses as we head into 2019. People no longer go to social media to exclusively chat with their friends and family. People use social media to do business, to advertise their brand, to read reviews from other customers, to join groups who surround themselves by certain products. However, those people don’t want to leave Facebook, Instagram, or Twitter to talk to you. And why should they? In this day and age, it’s up to you to meet the customer where they’re at. This proactive approach helps break the ice on a personalized channel that can ultimately influence the customer experience. Social media also adds an omnichannel element to live chat software. Instead of only catering to websites, live chat can now exist on Facebook Messenger. Potential customers love to use their phones while they shop, so being able to act as a guide while they walk through the aisles of your store can really help increase conversions. The easier it is for agents to customize live chat software, the more likely they are to embrace it. When agents embrace live chat software, they do so because they see it has a positive effect on their work-life. When choosing a live chat solution for your business, it’s best to pick one that comes with customizable reports. Agents can tailor these reports to showcase the metrics that mean the most to them. If they want to learn more about the number of people they speak to on live chat, and then compare it with the number of people they’re on the phone with, they should be able to do that. If they want to see how many people who engage with them on live chat ultimately make a purchase, they should be able to see those numbers. Those numbers very clearly indicate what’s working and what needs work. If agents don’t have numbers in front of them to tell them this, they’ll never be able to optimize their own personal strategies to make the software worthwhile. The ability to work offline is also essential to improving the customer experience. We already talked about chatbots, but we do need to reiterate the fact that they play a significant role in an offline business strategy. Without chatbots, customers would be left to figure things out on their own, which typically results in higher abandonment rates. 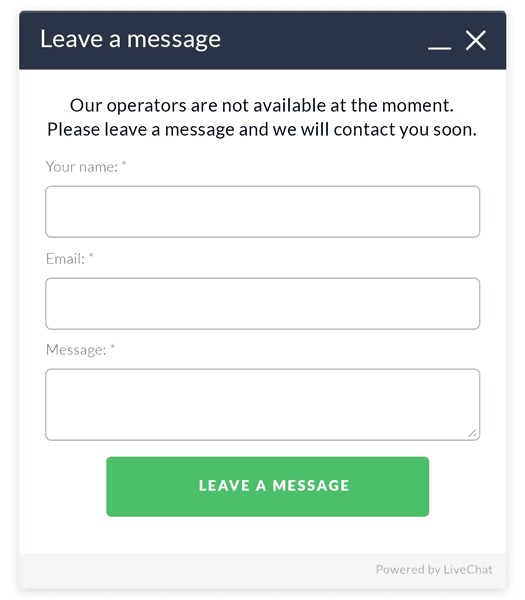 Message delivery is another unique way live chat software is doing more to improve the customer experience when agents aren’t available. In the grand scheme of things, offline message delivery isn’t a big deal, but little things add up. Being able to send a message offline so an agent can read it first thing in the morning helps to speed up the communication process. The faster conversations go, the easier it is to make a purchase or resolve an issue. Offline forms are essential when looking for live chat software. Forms are how your company will gather customer data that will ultimately dictate how you do business. Allowing a customer to fill out a form offline gives an agent the context they need to personalize a conversation and ensure the customer’s needs are prioritized. There are a number of live chat software providers that offer powerful solutions to businesses of all sizes in all fields. 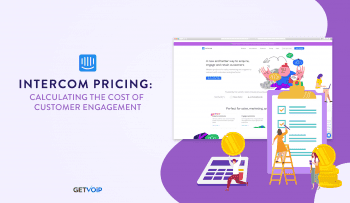 Now that we know what to look for when purchasing live chat software, it’s time to look at how much the software actually costs. More specifically, we’ll be looking at three live-chat-dedicated software providers and three CRM software providers who offer live chat solutions. We’ll also look at what their potential limitations are. As you can see from the examples we’ve provided above, live chat software is an accessible solution with affordable price plans for businesses of all sizes. There’s no longer an excuse to pass on live chat software when free solutions are available and customer expectations are rapidly increasing. Live chat software is a powerful tool imperative to every business’ customer experience strategy going into 2019. 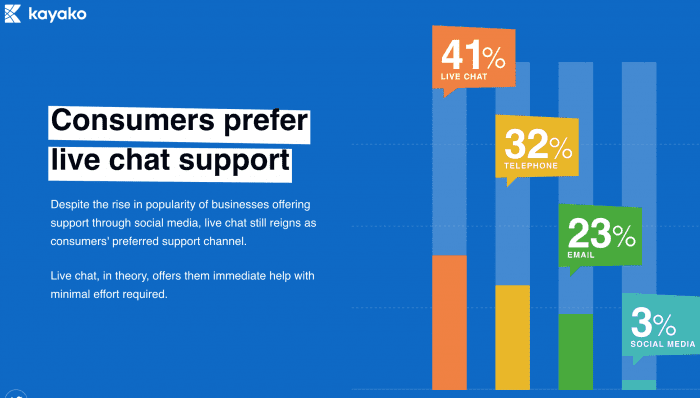 Customers prefer businesses who have live chat features because those businesses are going out of their way to engage customers the second they visit a website or open an app. This leads to increased personalization throughout the buyer’s journey, which is what ultimately sets one business apart from another. Many businesses look to live chat software because it offers their agents the ability to multitask and reach customers across multiple channels, which can also play an important role in optimizing their omnichannel sales, marketing, and/or support strategies. AI is also advancing these communication solutions significantly, making them much more powerful than they ever have been. When solutions offer chatbots to businesses, they enable businesses to offer their customers 24/7 support. The ability to be more accessible while allowing agents to focus only on the most important issues is a feat many businesses have always dreamed of. Now that the technology is here to offer 24/7 support and reach across channels via social media integrations, live chat software can start being taken advantage of. Businesses no longer have to worry about meeting the needs of the customer when they offer a channel that offers immediate results. If you’re still on the fence about purchasing live chat software, now’s the time to make that purchase. It’s no longer a significant investment, as you can see from many of the top providers we listed in the chart above. In fact, many providers offer free versions of their software so even startups can join the fun. Live chat software is imperative to your future customer experience strategies as customer expectations continue to increase.